If you're anything like me, you grew up playing with your grandmother's beauty supplies. Spraying her perfume, trying on her lipstick, and having all kinds of mischievous fun with your grandma's stuff. I have fond memories of doing all of this. But one of my favorite things was her powder. I didn't know why she used it, but it always smelled soft and floral. As an adult, I came across several deodorant powder and/or foot powder recipes. It wasn't until I started really taking a look at them that I realized what my grandmother's powder was for. Body powder is awesome. It helps to keep you feeling fresh even in the hot summer months in Florida. Think of it as a dry deodorant that you can use anywhere. Anywhere on or off your body, where funky smells tend to accumulate. You can use it on your thighs to keep them from chaffing during your workout routine, you can dust your feet before putting on your shoes to keep the foot odor to a minimum, you can lightly dust your entire body after a shower to help you feel fresh and smell great, you can even lightly dust your gym bag to help keep your workout clothes smelling fresh. There are so many uses for body powder. I also use my home made body powder as a base for some of my home made makeup. Just add a few colorants to your body powder and you have a loose blush, shadow, or foundation. Most body powders you find commercially are made with talc. Talc has been linked to several instances of cancer. Using caution with talc is a good idea. 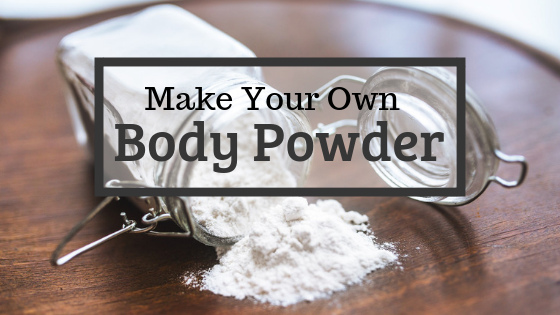 Instead, I make my own body powders using arrowroot powder. However, you can use any of a variety of powders as your base. For your base you want to use an absorbent powder, particularly one that also has antibacterial properties and that is ultra fine and soft on your skin. Here are a few options that work pretty well. I prefer to use a combination of powders for my base. Some of my favorites include arrowroot, cornstarch (non-GMO), tapioca starch, rice flour, baking soda, kaolin clay, french green clay, betonite clay, or any of a variety of cosmetic clays. You can add ground herbs to your powders as well. These can help improve your skin, prevent acne, help heal wounds, and they smell lovely. Some of my favorite herbs to use include chamomile, lavender, calendula, rose, elder flower, peppermint, lemon balm, and jasmine flowers. Each one of these herbs has different properties, but all of them are known for helping improve the health of skin. You can also add essential oils to your powder. They may cause clumping if not mixed well, but if you mix them well they can add more health benefits and a beautiful scent to your powder. Try lavender, jasmine, ylang ylang, frankincense, myrrh, and rose geranium. These oils are some of my favorites, but you can use any essential oil you'd like. Just keep in mind that some cause photosensitivity (making your skin sensitive to sunlight), and all essential oils are extremely strong and should always be diluted before use. An additional word of caution. Avoid using eucalyptus, rosemary, and camphor essential oils around people who have seizures, as well as young children and pets. I like to use around 10 drops of essential oils per 1 cup of powder for these recipes. And here are some of my favorite recipes for body powder, starting with the super basic, unscented recipe, and going a bit more complicated. Enjoy! Combine the ingredients in a bowl and whisk well. Combine the ingredients in a bowl and whisk well. If you need to grind your flowers and/or petals, a coffee bean grinder works really well. Just remember that you don't want to use the same one you use for your coffee or you'll have floral coffee. Combine the ingredients in a bowl and whisk well. If clumps form when you add the essential oils, just break them up with the whisk and mix a little longer. If you need to grind your flowers and/or petals, a coffee bean grinder works really well. Just remember that you don't want to use the same one you use for your coffee or you'll have floral coffee. I hope you enjoy these body powder recipes. For more essential oil blend ideas, check out my previous entries, Herbal Home Fresheners for Spring and Car-Omatherapy. If you have any questions or comments, please leave them below!